The White House refuses to back down. 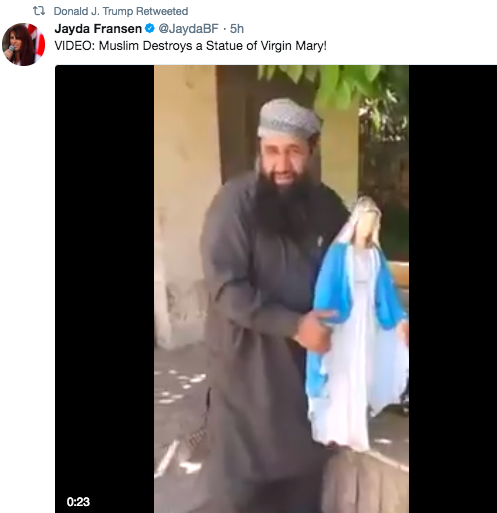 White House press secretary Sarah Huckabee Sanders on Thursday refused to back down from her defense of President Donald Trump’s decision to share a string of inflammatory videos that purported to show Muslims attacking people and, in one case, destroying a statue of the Virgin Mary. Promoting such content, she insisted, serves to “elevate the conversation” surrounding the fight against terrorism. 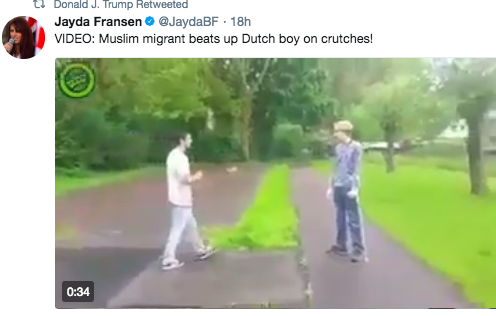 The videos that Trump retweeted Wednesday were initially shared on Twitter by Jayda Fransen, the deputy leader of the far-right group Britain First, which was founded in 2011 by former members of the British National Party and campaigns against “Islamization.” Last year, Fransen was convicted of religiously aggravated harassment after verbally accosting a woman wearing a hijab. As the New York Times explained, the presentation of the videos was grossly misleading, and it’s unclear whether all of the perpetrators are actually Muslim. On Thursday, Sanders repeated her earlier remarks suggesting that Trump has no obligation to verify a video’s accuracy before sharing it on his closely watched social media accounts. She also said that she did not believe Trump knew who Fransen was before retweeting the videos she had shared. 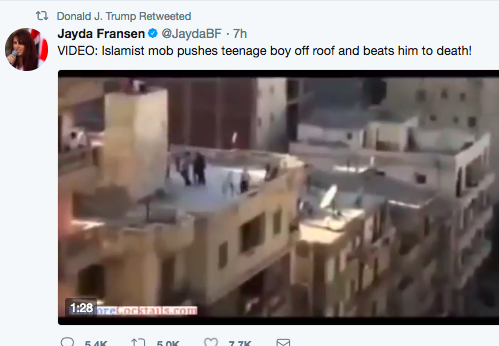 Trump’s promotion of the incendiary videos on Wednesday sparked widespread condemnation, and even attracted a rare public rebuke from British Prime Minister Theresa May, who explicitly called it “wrong” for the president to have shared them. In a tweet a few hours later, Trump shot back at May, telling her via Twitter not to focus on the affairs of the United States.